As heavy bag training doesn’t require a partner, hitting a heavy bag is one of the most common and effective routines for boxing training, if you’re going to be using a heavy bag for home use then our table above will show our best heavy bags. These heavy bags relate to hanging heavy bags, for freestanding heavy bags click here. The heavy bags for home use don’t tend to be as tough and durable as the ones in health and fitness gyms and definitely not as tough and durable as the ones in boxing gyms. 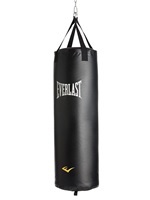 Health and fitness and boxing gyms tend to purchase heavy duty commercial heavy bags as it’ll take a lot more punishment from much more users. If you already have access to a heavy bag and don’t have room at home for your own hanging heavy bag then make sure you have the best boxing gloves to use when hitting the heavy bag. Don’t feel that heavy bags designed for home use won’t be tough and durable enough for you though, it’s only likely to be used by yourself and a few others and won’t be taking nowhere near as much punishment as ones in a commercial or boxing gym therefore should last a lot longer. What Is A Heavy Bag Used For? Combination punching – As the heavy bag swings slowly this is good to practice and try out different combinations of punches. 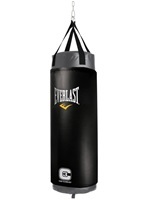 You can practice 1, 2, 3, 4, 5 or 6 punch combinations on the bag and master a wide range of different combinations. 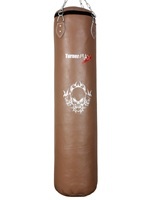 Technique – A lot of boxers underestimate the benefits of having the correct technique, the heavy bag is a good equipment to use to master each boxing punch. 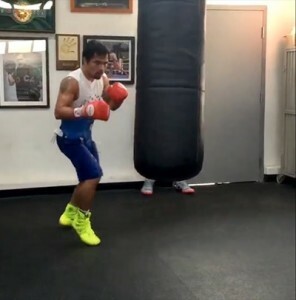 Unfortunately uppercuts are very difficult to land on a standard heavy bag so this punch will have to be practiced on an uppercut bag or pads with a partner. Power – This is what most newbies would go for when they start hitting a punch bag, yes a heavy bag is used to build power as well but don’t sacrifice learning the correct technique for power as a lot of power is generated from good technique. Fitness – If you’re working out alone then the only person who can determine how tough your workout and routine is, is yourself. If you set yourself a good routine that’ll allow you to push yourself then the heavy bag can be a very effective way to increase your stamina and endurance. 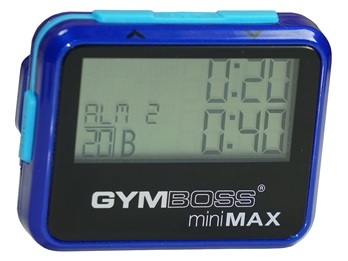 One way of doing this is to buy a round timer or use an app on your smart phone and set yourself a number of rounds with a rest time in-between rounds, as you get fitter increase the length of the rounds or shorten the rest time. A Standing punch bag is used to work on similar attributes but there are some other attributes a standing punch bag will be better for. For more tips on training and heavy bag routines check out this article. Length – Most of the bags will be around 4ft long which should be a good length but if you want the bag for kicking as well then a longer bag such as 5ft would probably suit you more. Choosing a bag too short such as 3ft will swing too much when you hit it. Weight – The weight plays a major factor in how much the bag is going to swing when you hit it. Generally speaking the heavier the bag the less it will swing. 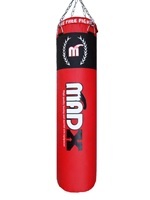 Some bags such as the Madx punch bag will have a zip where you can access the inside of the bag so you can fill it up with extra weight, in this case up to 70kg. Diameter – Having a bag with a small diameter (less than 30cm) will increase the chances of the bag swinging more wildly, it would probably also be more difficult to throw combination punches as well. A bag with a large diameter would usually mean that it’s heavier so it won’t swing as much but again it would be quite difficult to throw combination punches as well because it would be too bulky. The diameter of the bag is probably more to tailor for the user, so if you are tall and wide then a bag with a large diameter won’t be an issue for you. Wall bracket – A wall bracket screws onto the wall and sticks out by about 40cm so the bag and hang off it. Providing you fix it to a solid wall, this would be very strong and sturdy. There are different styles to choose from, such as a folding wall bracket or one with a pull up bar attached. Requires D.I.Y including using tools not everyone is comfortable using such as a drill. You have to fill the holes up when you decide to take the wall bracket down. Ceiling hook – This drills into the ceiling or equivalent such as a wooden beam which then the bag can hang off it. Depending on where you place the ceiling hook, usually this will allow a 360° movement around the bag. Requires D.I.Y including using tools such as a drill and ladder. More limited to what you can fix the ceiling hook onto. 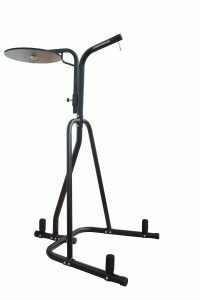 Heavy bag stand – Made from a big solid frame, heavy bag stands allows you to hang a punch off it without having to drill any holes in the wall or ceiling. Doesn’t require you to drill any holes into your wall or ceiling. Can be placed anywhere where there’s sufficient space. Some stands will have a multi-purpose function, such as having a speed ball stand as well. May need to buy additional weights to stabilise the frame, especially if you’re a big hitter. It’s quite expensive to buy and usually cost more than the punch bag itself. 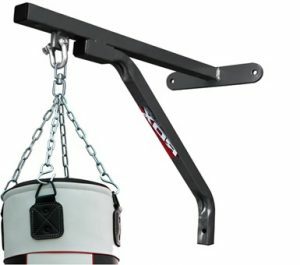 Universal punch bag hanger – The small and portable universal punch bag hanger allows you to freely place it anywhere where it’ll allow you to wrap onto. Can wrap onto strong and stable wooden beams or poles. 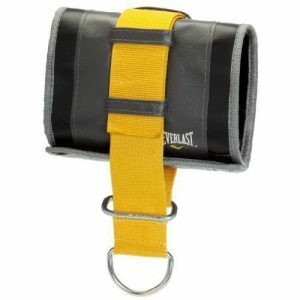 Small and portable so your heavy bag workout doesn’t have to be limited to one spot. Limited to what you can attach it to. Able to practice combination punching. Able to work on your technique. You can develop and increase your power. Able to improve your stamina and endurance. 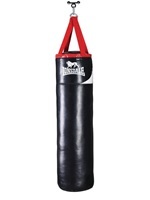 A heavy bag generally absorbs punches better than what a freestanding punch bag. You can develop bad habits such as dropping your guard. It’s easy to neglect your defence because the bag doesn’t hit back so you’re always thinking about attacking. The bag is always going to return to the same position so it’s easy to forget to move around the bag and keep on the balls of your feet. Excessive use can cause injuries because of the high impact and wear and tear heavy bag training causes.